Beaumaris Castle, located in the town of the same name on the Isle of Anglesey in Wales, was built as part of Edward I's campaign to conquer the north of Wales after 1282. 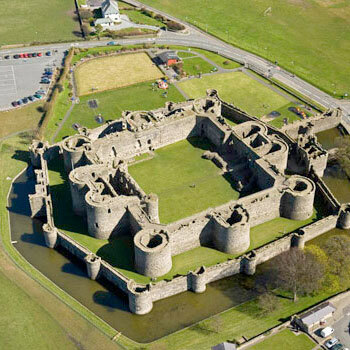 Plans were probably first made to construct the castle in 1284, but this was delayed due to lack of funds and work only began in 1295 following the Madog ap Llywelyn uprising. A substantial workforce was employed in the initial years under the direction of James of St. George. Edward's invasion of Scotland soon diverted funding from the project, however, and work stopped, only recommencing after an invasion scare in 1306. When work finally ceased around 1330 a total of £15,000 had been spent, a huge sum for the period, but the castle remained incomplete.